Hank (Don's brother) and I double-dated with Lois and Don a lot. Many of the dates consisted of us each taking our ten cents and spending the evening at Baer's Den (the ice cream/diner by the high school). One nickel would go in the juke box and the other bought a coke! With four of us pooling our resources, we got to dance quite awhile! 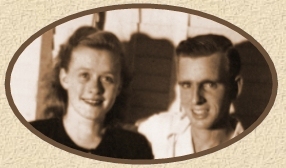 Both Lois & Don were very artistic, and both were on the CLIFFS (High School yearbook) staff. They both adored Miss Brace (art teacher) and even crashed one of my class reunions because she was to be guest of honor that year! Lois was a true "do-gooder" in many ways. It was she who brought Leo (a serviceman she met in NY City) home to our house for a weekend when she learned that he would not be getting "home" for Christmas. She was known to have stepped in between servicemen to break up fights before the MPs did! And we all know how generous she was! Lois was a "shopaholic." If there was something on sale, she'd buy not one item, but many, and share them with family and friends. She couldn't resist a bargain or the urge to "take care" of others. Mom used to say that every stray animal in the world followed Lois home when she was a child growing up. As an adult she had many interests. She loved to make craft items, such as knitted Xmas stockings and ornaments, beaded jewelry and Barbie clothes for all the little girls in the family. She went through a stage where she became very interested in growing different varieties of orchids and built a small greenhouse in her backyard for that purpose. I have Lois and Don to thank for my long love affair with skating. They took me skating at the Town Hall Roller Rink in Scranton when I was nine years old and I was hooked! Five years later I won my first silver medal at nationals and they were like proud parents!